An appeal to erect a statue of a popular Manchester comedian, who started his entertainment career as a pub pianist, is being launched. 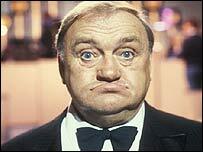 The bronze statue of Les Dawson, who died in 1993, aged 62, will stand in Lytham St Annes, Lancashire, where he lived with his family. Benefit shows, a celebrity golf tournament and auctions are all planned to help raise funds for the statue. The comedian, known for his deadpan style, was born in Collyhurst. He found fame after working as a pianist in Northern working men's clubs - his off key recitals becoming a trademark. His television debut was on the talent show Opportunity Knocks. He then went on to have his own television show and host BBC's Blankety Blank gameshow. 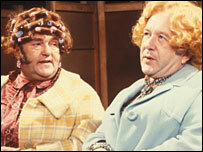 Some of his best known routines featured Roy Barraclough and Dawson as pensioners Cissie Braithwaite and Ada Shufflebotham. Fylde Council is supporting the project and said it has agreed the statue will be put on council-owned land.